In the 2008 election, despite the political resurgence of the Democrats nationally and within the state due to national issues, the results of voting on the propositions continue to support the contention that there are three Californias, politically, socially, and economically. Yes, as in the past there is some shifting of results. 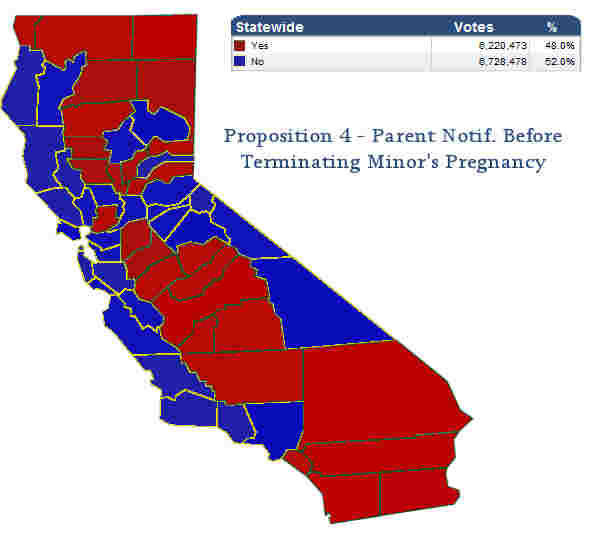 The "liberal" no vote on Proposition 4 carried a number of "Northern California" and Southern California counties while the "conservative" yes vote made some slight inroads into Coastal California. On the other hand, the "conservative" yes vote on Proposition 8 made more inroads into Coastal California while the "liberal" no vote made few inroads into the other two proposed states. Lastly, the agricultural interests were able to successfully oppose Proposition 2 only in a few counties that would be located in Northern California, counties that almost always vote "conservative." The results of this election provide continuity to the evidence that politically, socially, and economically, California needs to be divided into three states as discussed in this web site.